With Dwight, Hermes, Cubert, and the Professor. He is known to have worked for an ad agency, as he appeared in a commercial for Planet Express (1ACV02). However, it is unlikely that he met anyone at the company directly, as he doesn't seem to recognize Hermes Conrad or Professor Farnsworth before, during, or after beating them to a pulp, an act caused by a lot of stress down at the plant he was working in, which introduced computers in 3002 (3ACV12). He has also worked as a stockbroker (3ACV21). Later, the bad influence of Bender to his son made him become one of the FART (4ACV06). Additionally, H. G. Blob seems to be on the Earthican $20 Bill (BBS). 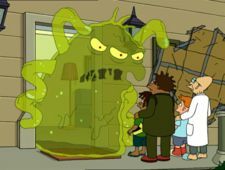 In 3010, Horrible Gelatinous Blob fried a hobo during the Heating of the Western Hemisphere (6ACV08), and attended the 100th Delivery Party, being the first guest to have entered the Planet Express headquarters (6ACV12). H.G. Blob is featured on one of the discs of The Complete Collection 1999-2009. His name was spelt Mr. H.G. Blob in the package the man who is not Evans gave him (1ACV02). These initials may be a reference to science fiction author H. G. Wells. His voice is very similar to the voices of Lrrr, ruler of the planet Omicron Persei 8, and Morbo, co-host on Channel √2 News. All three characters are voiced by Maurice LaMarche, who has stated that they actually sound pretty different. In The Beast with a Billion Backs, he describes Yivo as being "horrible". This is ironic, as he is a horrible creature himself and his first name is also "horrible". A poster for "Space Mutants 5" featuring an image of a Horrible Gelatinous Blob appears in the dorm room of the nerds Homer Simpson meets in Season 5 Episode 3 of The Simpsons, "Homer Goes To College". This page was last edited on 16 February 2017, at 15:50.